1.Can you tell me about yourself? Answer: In my QA career, I have been working on various system platforms and operating systems like Windows 95, Windows 2000, Windows XP and UNIX. I have tested applications developed in Java, C++, Visual Basic and so on. I have tested Web-based applications as well as client server applications. 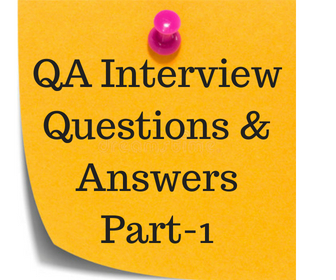 As a QA person, I have written Test Plans, Test Cases, attended walkthrough meetings with the Business Analysts, Project Managers, Business Managers and QA Leads. I have attended requirement review meetings and provided feedback to the Business Analysts. I have worked in different databases like Oracle and DB2, wrote SQL queries to retrieve data from the database. As far as different types of testing is concerned, I have performed Smoke Testing, Functional Testing, Backend Testing, Black Box Testing, Integration Testing, Regression Testing and UAT (User Acceptance Testing) Testing. I have participated in Load Testing and Stress Testing. I have written defects as they are found using ClearQuest and TestDirector. Once the defects were fixed, retested them and if the passed, closed them. If the defects were not fixed, then reopened them. I have also attended the defect assessment meetings as necessary.In the meantime, a continuous interaction with developers was necessary.This is pretty much what I have been doing as a QA person. 2. What did you do in your last project? Answer: In my last project, the application was a web-based application developed in Java platform. As a QA Person, I wrote Test Plans from the requirement documents and Use Cases. I performed Smoke Testing, Functional Testing, Backend Testing, Black Box Testing, Integration Testing, Regression Testing and UAT (User Acceptance Testing). I have participated in Load Testing and Stress Testing. I attended several walkthrough meetings for requirement reviews and provided feedback to the Business Analysts. Mostly, I was in the backend testing, which required writing SQL queries directly to the database. Besides these, I wrote defects using ClearQuest. Once the defects were fixed, retested them and if the passed, closed them. If the defects were not fixed, then reopened them. 3. Have you written Test Plan? What is a Test Plan? What does it include? Answer: A Test Plan is a document that describes the scope, approach, resources, and schedule of intended testing activities. It identifies test items, the features to be tested, the testing tasks and who will do each task (roles and responsibilities) and any risks and its solutions. Answer: A Test Plan includes Heading, Revision History, Table of Contents, Introduction, Scope, Approach, Overview, different types of testing that will be carried out, what software and hardware will be required, issues, risks, assumptions and sign off section. 4. Have you written Test Cases? Did you use any tools to write Test Cases? Answer: Yes. I have used TestDirector (now called QualityCenter) and Rational TestManager to write Test Cases. However, in most of the companies, I used Excel sheet. How many Test Cases did you write in your last project? Answer: I wrote about 1100 Test Cases in my last project. (The reasonable number of Test Cases varies from 500 to thousands. The number 1100 test cases can be completed in 6-month project duration). What document did you refer to write the Test Cases? Answer: Requirement document. (NOTE: It can also be Use Cases, or Design Document. It depends company to company. In some company, they use Use Cases. In some companies, they use Requirement Documents and in companies, they use Design Document. However, in practical scenario, most of the companies have requirement document at least). 5. Did you have a situation where you did not have any documents (no requirement document, no Use Cases, or no Design Document) and you had to write the Test Cases? How did you write the Test Cases in this situation? Answer: Yes. I have been to that kind of scenarios several times. There were companies where they had no documents at all. In that case, I had to discuss the application scenario and functionalities with the Business Analysts or developer. On the basis of that discussion, I prepared a document in consultation with Business Analysts and Developers and then started writing Plans and Test Cases. 6. What you worked with Use Cases before? Answer: Yes. I have written Test Cases using Use Cases. Can you tell me what a Use Case is? Answer: A use case is a document that describes the user action and system response for a particular functionality. 7. What is SDLC (Software Development Life Cycle)? (i)Generating a Concept – A concept comes from the users of the software. For example, a Pizza Hut may need software to sell pizza. An Indian store may need software to sell its newly arrived movies or grocery. The owner of the company feels that he needs software that would help him in tracking his expenses and income as well as enhance the selling process. This is how the concept is generated. The owner will specifically tell the software company what kind of software he would need. In other words, he will specify his requirements. (ii) Requirements analysis – After the owner (user) knows his requirements, then it is given to a software team (company) who will analyze the requirement and prepare requirement document that will explain every functionality that are needed by the owner. The requirement document will be the main document for developers, testers and database administrators. In other words, this is the main document that will be referred by everyone. After the requirement documents, other detailed documents many be needed. For example, the architectural design which is a blueprint for the design with the necessary specifications for the hardware, software, people and data resources. (iii) Development: After the detailed requirement documents (some companies have design documents instead of requirement documents), the developers start writing their code (program) for their modules. On the other hand, the testers in the QA (Quality Assurance) Department start writing Test Plans (one module=1 test plan), test cases and get ready for testing. (v) Production: After testing, the application (software) goes into production (meaning, it will be handed over to the owner). (vi) End: And one day, the owner will have say bye to the software either because the business grows and this software does not meet the demand or for some reason, the he does not need the software. That’s the end of it. 8. What is Business Requirement Document (BRD)? Answer: It is a document that describes the details of the application functionalities which is required by the user. This document is written by the Business Analysts. 9. What is Business Design Document? Answer: It is the document that describes the application functionalities of the user in detail. This document has the further details of the Business Requirement Document. This is a very crucial step in Software Development Life Cycle (SDLC). Sometimes the Business Requirement Document and Business Design Document can be lumped together to make only one Business Requirement Document. 10. What is a Module? 11. What is walk-through meeting? Answer: Once the Business Analysts complete the requirement document, they call a meeting to explain how the functionalities work, what the process is in the designed application and other details. The Business Analysts explain the high level functionalities of the application (software) that is going to the built. The participant members in the meeting may provide feedback and various point of views are expressed. This is walk-through meeting. 12. What is a Use Case and what does it include? Answer: A Use Case is a document that describes the user action and system response for a particular functionality. It includes cover page, Revision History, Table of Contents, Flow of Events (normal flow and alternative flow), Exceptions, Special Requirements, Pre-conditions and Post-conditions. 14. What does the Build Deployment mean? Answer: When the Build so prepared by the CMT (Configuration Management Team), it is deployed (put) to different Test Environments, it is called the Build Deployment. 15. What is Test Strategy?